Benjamin Meggs at Bluewater International Yacht & Ship is now wearing two hats as he's been appointed sales director of Italian superyacht builder Privilege and currently has listed for sale the 127 metre in-build motor yacht Privilege One. The yard is working to complete the build within the next year and she is immediately for sale. Being built in steel to a design by Laraki Yacht Design, everything on the yacht is on a gargantuan scale. Among other amenities, she features five swimming pools, a beauty parlour, a cinema, two helicopter pads and a submarine that emerges from the side of the hull. There is also a large beach club and an elevator that connects all decks. Accommodation is for 28 guests and 39 crew. The master suite has private access to the top heli-deck and there are 12 opulent guests suites. Each guest suite has 150 square metres of space and each comes with two dressing rooms, two en suite bathrooms and a private balcony overlooking the sea. 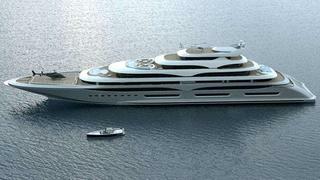 Privilege One is powered by three ABB Azipod 4,500kW drives and is asking €399 million.